‘Tis the season to be jolly….and wasteful. A recent report stated Americans will create an extra 25 million tons of waste between Thanksgiving and New Year’s. Think about it. Wrapping paper filling trash cans. Light displays spiking electric bills. Trees jamming up landfills. And the list goes on. But THIS holiday season can be different. The following suggestions will help you change your habits and start a new tradition, celebrating the holidays in amazing earth-friendly fashion. Turn Down the Amps – Leaving your holiday lights on 24 hours a day can significantly raise your energy bill. Use a timer for your light displays ensuring they are not left on all night. Also, when strands of lights wear out, replace them with LED lights which use about 90% less energy than standard mini-lights. Candle Glow – The holidays are the perfect time to light up your home with candles. A decorative arrangement of tall and short candles in a room is usually enough to eliminate some, if not all, overhead lighting. Not only will you save electricity, but the candles will be part of your décor. Furthermore, with the heat from the candles and your own body heat, most rooms will warm up nicely over the course of an evening allowing you to lower the thermostat. The result – you’ll save on your energy bill. Remember to use caution around burning candles. Use Natural Décor – Use locally grown items to decorate your home. Fill a basket with pinecones you collected at the park, and use it as a centerpiece on the dining room table. 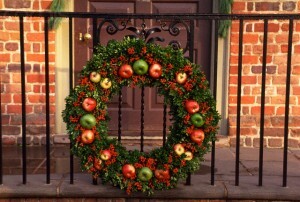 Snip a few branches from an evergreen bush or tree and create your own wreath for the door. Add pinecones and a bow or tuck citrus fruits into it for a pop of color. Make your own garland for the tree with popcorn, berries and nuts, for example. Cut your Card List – Over 2.6 billing holiday cards are sold each year and most end up in the trash. Trim you card list by just a few recipients and send them an e-card instead. You’ll save on postage and reduce waste. When sending traditional cards, choose cards made of recycled paper. As for the cards you receive, cut them up, they will make great gift tags for next year. Trim Creatively – There is no need to buy all new tree trimmings every year so you can have a new holiday look. Instead, create homemade ornaments. Make popcorn and cranberry garland or pinecone ornaments. Better yet, swap decorations with a friend each year. You’ll always have a fresh look. Consider Alternative Gift Wrap – With so much wrapping paper ending up in the trash each year, use your imagination. Wrap gifts with other items like a colorful blanket, a furry scarf, a T-shirt. Anything that covers your package can work as gift wrap. Or, have your kids decorate used brown paper grocery bags. Put gifts inside the bags and staple them shut. As for the gifts you receive. Open them carefully saving the paper for next year’s wrapping. Reuse Trimmings – Place a container in the middle of the room. Ask everyone to put bows, boxes, gift bags, and ribbons in the box for use next year. Recycle – Face it. Gifts come with lots of wrapping and packaging. As you open gifts, recycle what you can, plastic, paper, cardboard, etc. Don’t stop there. Recycle your tree as well. Check with your local government or municipality. Some places recycle trees into mulch, others use them for animal habitats in parks and lakes. However you choose to recycle your tree, do it responsibly. Make sure all ornaments, hooks, tinsel and light strands are removed. Artificial trees can be recycled too. If you’re tired of your artificial tree, donate it to a church, community center, shelter or another place that decorates for the holidays. The holidays are exciting, fun, and they are major waste makers. Now is the time to do your part and start changing the holidays for the better. These environmentally-friendly holiday tips will get you started.